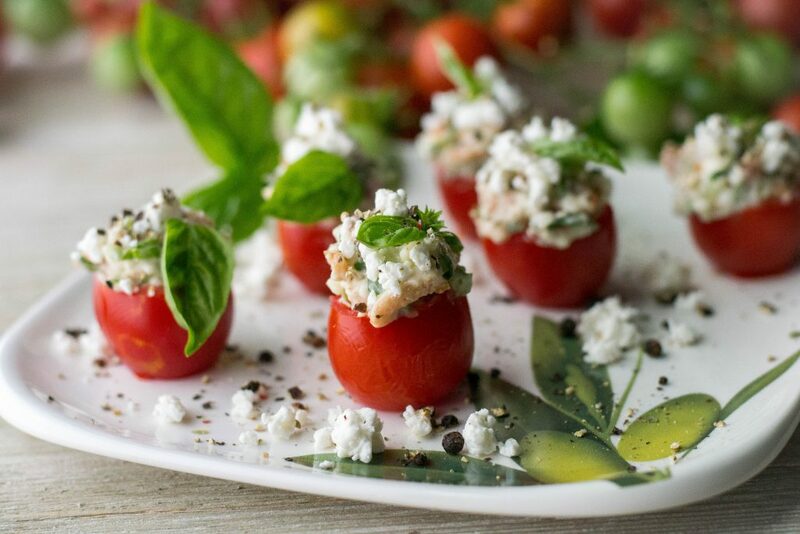 Bacon Goat Cheese Filled Cherry Tomatoes - What the Forks for Dinner? Holiday time 2014 our blog was just a year old, we were such newbies …..still are in many way…lol! 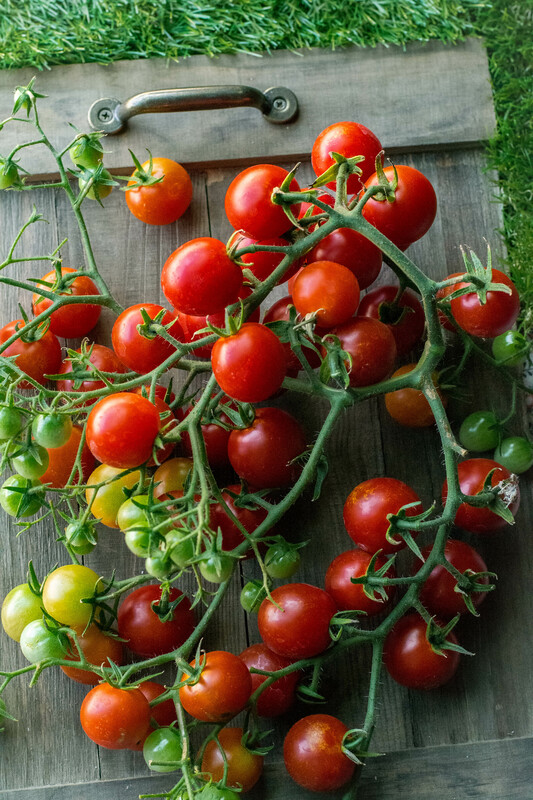 I made a recipe for the holidays using cherry tomatoes and it was delicious, but our remake using our own garden fresh cherry tomatoes…….I just can’t describe!!!!!!! 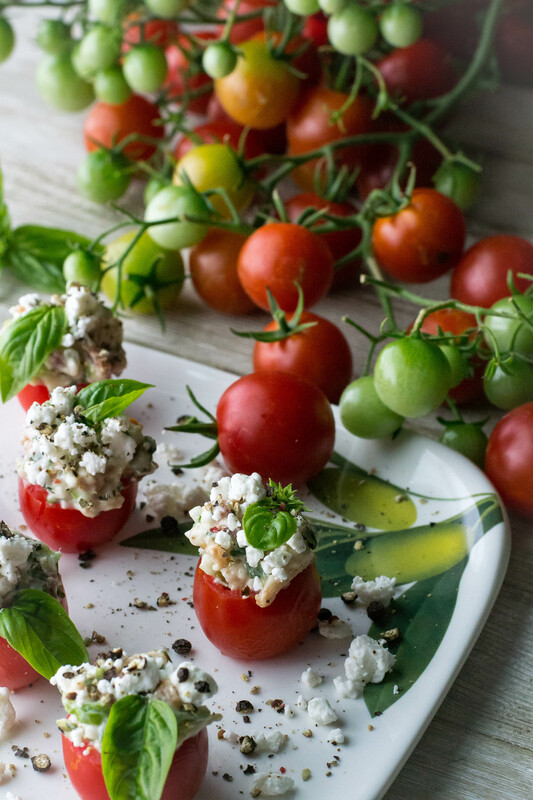 Having a garden and the glorious veggies that come from it….. nothing can compare. There is nothing better than a fresh home grown tomato. Store bought pales horribly, and thats an understatement!! In all my years of gardening, I have never had such a beautiful crop. The plant, if it could stand up on its own would be over 8ft tall. Loaded my tall beauty is, so be prepared for more recipes featuring ….thats right cherry tomatoes. Our original recipe was Bacon Filled Cherry Tomatoes which I got years before from one of those little cookbooks they sell in the checkout line. Some of my best and most favorite recipes have came from those little books. This is one of those recipes. Bacon can do no wrong……BLT….need I say more?? These are reminiscent of a BLT minus the bread and plus cheese. Hollowing out cherry tomatoes and filling them with a mixture of bacon, Miracle Whip (mayo if you must), green onions, parmesan cheese, and basil is wonderful. They are a perfect bite size appetizer or snack. How do you improve on something so good you might ask?? 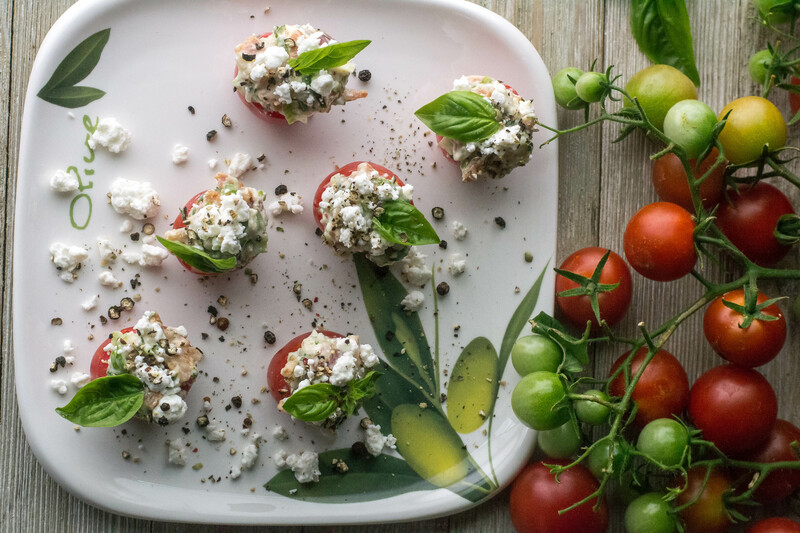 Add goat cheese…thats right goat cheese. I don’t know why I didn’t think of it before. Now you have something reminiscent of bruschetta, again minus the bread. Getting the insides of the cherry tomatoes out is easy using a melon baller. If you don’t have one you need one, you can get them anywhere and they are inexpensive. Also, they are the perfect tool for this job. 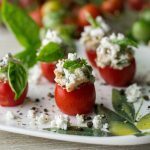 Cut the top off of the cherry tomatoes and using the tiny end of the melon baller, gently scoop out the inside of the tomato and discard. If they do not stand up you can slice a small piece off the bottom. I turn mine upside down on a paper towel and let them drain for about 10 minutes or so just make sure they do not turn the filling watery. Admittedly, filling them can be a bit of a challenge, but a small spoon and alas your fingers, and they fill quickly. 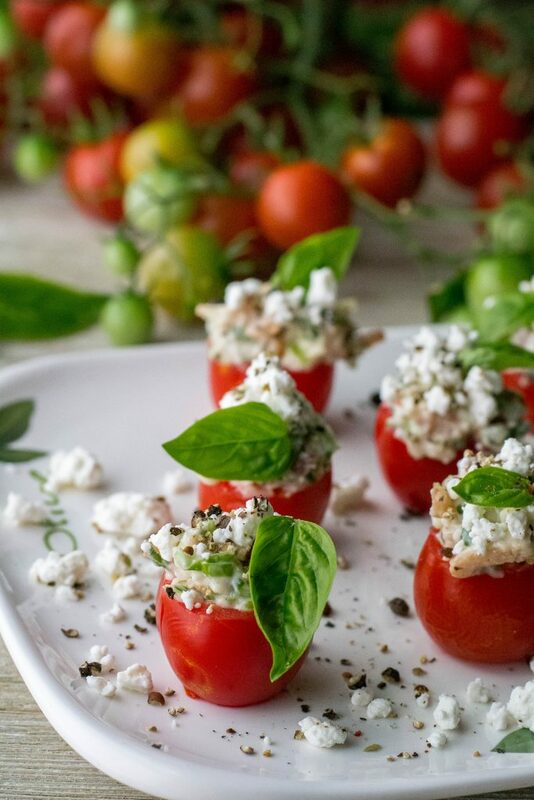 Sprinkle them with extra crumbled goat cheeses and dust them with crushed black pepper……..beautiful and delicious. If you have an over abundance of cherry tomatoes….if you don’t head over to your local Farmers Market and get your self some and try our Bacon Goat Cheese Filled Cherry Tomatoes …..perfect light summertime appetizer! In a medium bowl, combine bacon, green onion, basil, goat cheese, and miracle whip. Fill with bacon mixture and garnish with extra goat cheese, crushed pepper and basil if desired.